Pre-Order your Debbie Pucek Designed Custom Art-Hunger T-shirt! Limited numbers will be made of this full color shirt! You have the option to pay shipping or meet us at out November show in Grapevine and pick up for FREE. We decided to make the first run of these printed on white shirts! Sizes available from small to XXL. Shirts will be available mid October via pre-order. Estimated 50 shirts or less will be made. 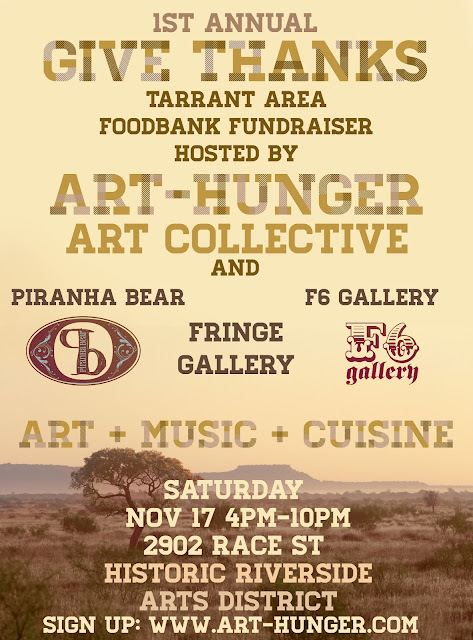 Check out what new is going down for Fort Worth Gallery Night! At the new Fringe Art Studio, you can catch Gallery Night’s intersection with embRACE theSTREET, a project to create a new walkable arts district on Race Street, just northeast of downtown Fort Worth. Fringe will display works by owner Rebecca Kale and the collective known as Art-Hunger. In addition, you can find live music, body painting, food trucks, a dog park, strolling entertainers, and the unveiling of a newly installed community garden, not delayed at all by the recent theft of some of the frames. Great group of artists that came out to show their talent yesterday in the September Grapevine Monthly! The support for the arts in Grapevine is amazing and will only continue to grow! The city is excited about the professionalism and level of skill everyone is bringing to the monthly shows! T-shirt / graphic contest final voting day is quickly approaching. September 7th is the final day for voting "LIKES" on our Facebook page in the t-shirt contest photo album. The most "LIKES" on a particular image wins! The winner will be announced September 8th during gallery night in Fort Worth on Race Street where several artists will be displaying and representing Art-Hunger. Stop by Race Street off Riverside in Fort Worth where you can get your fill or fine art, live DJ's, live music, trunk show, food trucks and more! 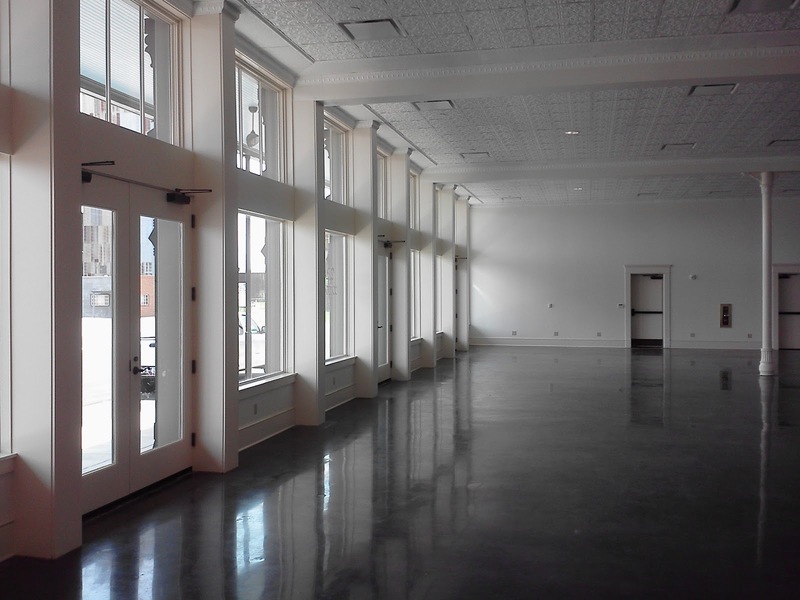 Race Street in the latest revision in Fort Worth's restoring of a historical arts district. GrapeFest is this Thursday the 13th- Sunday the 16th. Sign up on the registration page to hang your work at Molten Metals Foundry during one of the most prolific Festivals in Texas: GrapeFest! This four day event includes live music, art, food, beverages and the largest wine tasting competition in the country! An estimated 138 wines involved! This is a great chance to get you name out as a Texas artist. There will thousands upon thousands of visitors every day! We are SOLD OUT on booth spaces for Sept 1st show in Grapevine! ( actually over booked ) The weather will be great and looking forward to meeting some new artists! Artists: you will be receiving an email for instructions on setup/ tear down, etc for the show this evening via the email address you paid with (paypal). If you do not get an email tonight, please contact us. This is also an open call for artists who need to rent 8' tables-5.00 each and easels ( both table top and floor size ) 4.00 each. Email your needs to nickckirk@yahoo.com - these are limited and on a first come forst serve basis! Nick C. Kirk is opening a bronze casting foundry on S. Main Street in Grapevine which is in the middle of the 4 day Grapefest September 13th-16th Festival. His foundry, Molten Metals Foundry will be open to the public all day every day of this event as a meet and greet to the public. He will be giving small demonstrations throughout the day of the processes of sculpting and casting. He is also opening up his doors to artists to show and sell artwork on his walls through Art-Hunger. The artwork will be hung salon style all the way up to the 16' ceilings. So the artists don't have to physically be there during each day, Nick has come up with the following solution: There will be a small hanging fee and a small selling fee. Each artist may submit up to 5 two dimensional works of art for display-(if a piece sells, the artist will be notified and be able to hang another in it's place) Each piece under 24" at it's longest side will be a fee of 15.00, and each piece between 24"-36" will be a fee of 20.00. If you wish to display sculpture, please contact us for pricing. 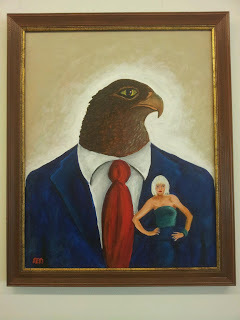 (which varies on size and space availability) All sales will go through Art-Hunger so the artists do not have to be present for a sell to occur. Sales fees consist of 15% of the final purchase. (includes sales tax & credit card fees) All sales will be paid to the artists on September 24th. (credit cards take several days to process payment) If you have questions, please contact Art-Hunger at info@art-hunger.com. Pieces must be dropped off to the foundry between September 9th -September 11th. This is a great chance for exposure and sales. This is a four day event with thousands upon thousands of visitors! Space is limited, this is on a first come first serve basis. Registration for the September and October Monthly's at Grapevine are still available. We have less than five spaces available for the September show. You're going to have to act fast to get into this exhibit! Indoors, out of the heat, no chance for wind or rain! 100% of sales go to the artists. Only a 30.00 booth fee to display and sell as much as you like. Any and all mediums are welcome and encouraged to setup at our shows! Go to our registration page to sign up! 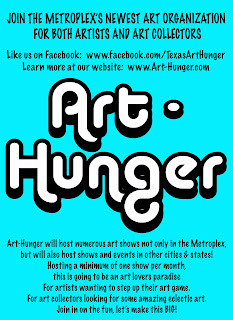 Art-Hunger, Helping Artists Move Forward. Filling up for September but spaces still available. Hey everyone we are filling up fast, but I just want to make it known there are still spaces available. Register soon! Also don't forget to go to our Facebook page and vote on the T-shirt designs. Our first monthly art show in Grapevine was a success even though the summer heat tried to keep away art lovers. We brought in over 3 times the normal foot traffic to the new clock tower building, and estimated over $2,000.00 in sales. (About $500.00 in the last 30 minutes) The September and October months will only grow as the weather cools down and word continues to get out about our events. The support from the artists and the community is overwhelming. See our events and registration pages for new exhibit opportunities. All Grapevine booth spaces are first come first serve. With an estimated 20 spots per show, don't miss your chance to promote your creative side! Art-Hunger Aug 4th Grapevine Show coming up! We are excited about our first show in Grapevine! We are getting a huge positive response from artists and the surrounding community. For those looking to find some amazing art, be sure to come check out the local talent. 100% of all sales go to the artists. Tell your friends and tell your family. We have an estimated 18 artists showing their work! We have just a couple spots left if any artists want to set up shop! (go to the registration page and sign up!) We will be offering pre-sale sign up registration for the September 1st exhibit during the August 4th show. Artists will get to sign up early during the show for the following exhibit not only before registration is posted on our webpage, but will also get a discounted rate! Art-Hunger will have a couple donated pieces of artwork for sale by some of the artists. All proceeds will go 100% to Art-Hunger's 'materials fund.' The materials fund is used to buy items such as tables, easels, extension cords, hangers and more to make the next show a little bit easier for the artists showing. Art-hunger will also be selling artist custom made t-shirts which will go towards the 'touring fund.' 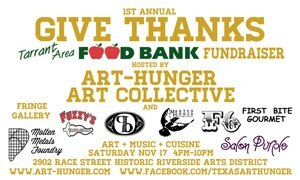 This is a fundraiser to help Art-Hunger artists travel and showcase in other cities and states. All for the love of art! See everyone August 4th! Create the lastest art design that promotes and represents the art-hunger ideals. Design an image that uses the mouth as the main focus. 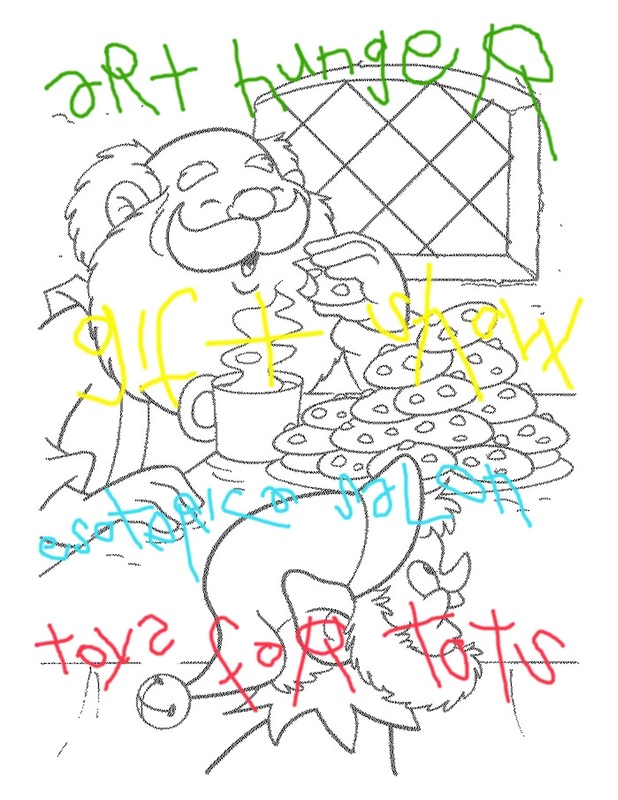 The winning design will be used as the main promotional image used for that quarter on Art-Hunger's website, Facebook, and apparel. The designer wins three shirts along with a free booth space in a future monthly Grapevine art show. 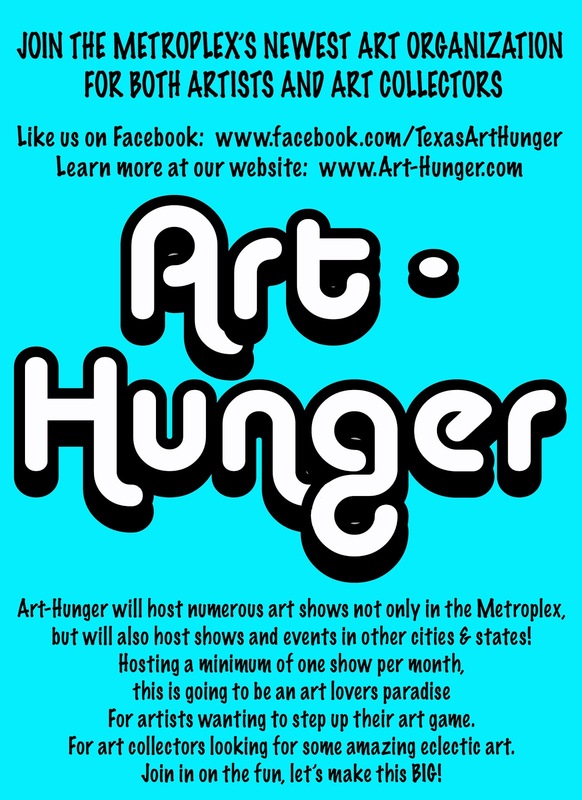 Send an image to info@art-hunger.com. 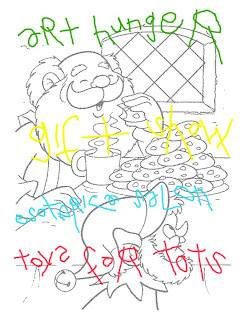 Upon approval and confirmation of the image it will be uploaded to the Art-Hunger website and to the Art-Hunger T-shirt Facebook album. 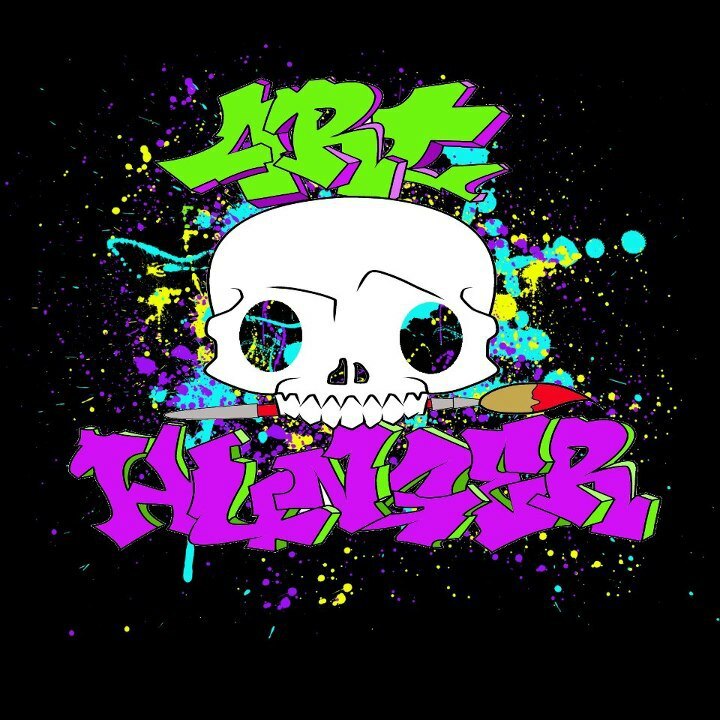 So tell your friends, families, and homies to visit the Art-Hunger page and vote for your design. SUBMIT NOW! Deadline to submit is August 29. Photos and voting will start September 3rd and end October 1st. The most LIKED design on Facebook will win! Rough designs will be accepted, but zipped Adobe Illustrator vector files are preferred. Images must be no larger than 6MB, no more than 300 dpi and less than 1600 X 1600 px. Once the design image is submitted, the artist agrees to relinquish all rights to the use of that design/logo to Art-Hunger. August 4th show registration is now up! Go to the Registration page to sign up! First come first serve, with limited space. We will post here and on the registration page when the event is full and no spaces are left. Show your work, sell you work, 100% of sales go to the artists. All mediums accepted. How hungry are you? Sign up now! Art Hunger the newest art organization by artists for artists and collectors. Check back for details on our premier home location art show August 4th, as well as other events coming soon! Here is a photo of the wonderful location for the August 4th Premier show.